As most of you know, I have recently succeeded Atra as Combat Master. I think I’ve lived up to my Telegram bio of “general nuisance” enough for most of you to recognize me by now, but for the unaware, I’ll give a very brief introduction of myself before I get to the good stuff. I’m Archenksov, until recently Alethia Archenksova. If you know me, it’s most likely from my leadership time in Odan-Urr, where I was on the clan summit for just shy of three years. As far as my ACC experience goes, I joined Wally’s staff and worked under him, and then Atra, for two years. During that time I got to work with many excellent judges, reads pages and pages of wonderful combat writing, and put my skills to use helping my fellow Odanites during the last Great Jedi War. I like to think I’m pretty approachable, so if we haven’t met, please feel free to say hello via Telegram (@Archenksov) or email ([Log in to view e-mail addresses]). Atra left me with a mature system and four great judges, so I’m excited to get to work. My general attitude towards updates to the system is that they should be refinements, little tweaks that remove ambiguity and make life easier and more fun for the staff and, most importantly, for the competitors. That said, there were two quick things I’ve done so far. 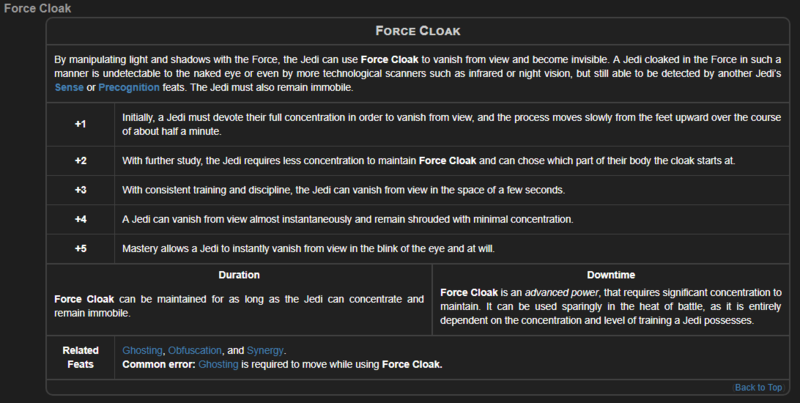 Wally and I have updated the Skills and Force Powers sections of the CS Guide. There hasn’t been any change to how those abilities work, but now if you look at each entry you’ll see links to any feats associated with them. For the Force powers, we’ve also highlighted some of the common sources of Realism detractors. There are a lot of feats (377, though not all are selectable) and it’s hard to keep track of all of them, especially if you’re newer. I really don’t like it when people discover a feat because they got dinged in an ACC match, instead of learning about it from the documentation. Hopefully, this change makes it much easier and more apparent to see what feats you need, and also what options you have when you plan out your characters. I want to give a quick shout out to Alaris Jinn, who tweaked the wiki templates to make this possible and saved me some trial and error and broken wiki pages. The ACC uses a version of the Elo rating system to rank ACCers. Previously, you had the option of playing ranked or unranked matches in the Duelist Hall and Funderdome, but Cooperative and Scenario matches were always unranked. I have changed that system—now, regardless of what format you choose, when you set up a match you get to decide whether it will be ranked or not. The active Scenario and Cooperative matches will stay in the (unranked) parent hall with all of the historical matches. Matches in vendettas and ACC events will continue to be ranked. One of the things I’d like to start doing is highlighting particular matches. There’s two reasons for this. First, there are a lot of members who do some phenomenal writing in the ACC, and I want people to read it and appreciate it. Hopefully it inspires you, as well. Second, part of how you learn to be good at writing is by reading. I’ll be linking to the match both on the site, which has the original judge’s comments, and a Google doc that I’ve annotated. There are a lot of people who are skittish about diving into the ACC, and they tend to have a lot of the same concerns. One that I’ve heard many times from JMs and lower equites is a concern about the power gap between their character and their opponent. Another is that their character isn’t “a combat spec.” These are both genuine challenges, but the ACC is all about creatively coping with challenges. So this month we’ll be looking at Adept Braecen Kaeth vs. Professional Jasper Arlow. This is a slightly older match, from 2017’s Great Jedi War XII open ladder. Both competitors had plenty of writing experience, Brae in the DB and Jasper outside of it, but their characters are very different. Braecen is an extremely powerful elder, specializing in lightsaber combat and offensive Force powers. Jasper is an NFU journeyman who did not put a single point into combat skills. So how did that work? Quite well, actually. You can see the original match here and my comments here. Finally, a big thanks to Brae and Jas for letting me highlight their work! Calenhad asks: For someone looking at doing more ACC writing through the scenario hall, what is the difference between Run On’s and cooperation in the Scenario Hall? A few things. The big one is that run-ons can have more than two members participating. Usually they're either casual things, or the whole team places together; in the ACC it's still a competitive, member vs member contest even if you're cooperating in-character. ACC judges provide more feedback than you normally get from fiction competition organizers, and there's a stronger focus on syntax and adhering to the details of the CS system. The ACC system also determines who goes first and how many posts each person makes, as opposed to ROs where the team decides that. The difference between the Cooperative and Scenario Halls is basically that the latter gives you a topic to work from, while the former gives you a venue and you have to come up with the rest. I haven’t gotten the chance to do a Scenario Hall match yet, so we’ll see how I like it. I have, however, dabbled in the Cooperative Hall. It’s got a very different feel from Duelist Hall matches and it’s a fun way to shake things up. It might also work better with the character dynamics between you and your opponent. Neither of them are as popular as the older halls, so I’m interested to hear what people who’ve tried them think. Creon asks: Do you have plans on events, expansion, or generating more popularity with the other ACC halls? Events: Yes, but nothing concrete. That’s going to require some coordination with the clans and the DC to clear a block of time off, as well as some staff discussions on what to do. A few people have mentioned the Coach’s Corner event Atra ran, and others (hi, Turel) have pointed out that we haven’t had an open championship bracket in ages. Expansion: Not really. There are a lot of options available already. My main focus is on boosting activity in the halls we already have, and on making the ACC more accessible. Other Halls: Well, you can earn Elo now for those halls so we’ll see if that helps. I’m honestly not sure why people haven’t engaged with the Cooperative and Scenario halls as much. I’ll be taking matches in them myself and publicizing other folks’ matches in my reports, and we’ll see if the added exposure helps. To be honest, I don’t especially care which halls people are active in as long as they’re active. Kadrol asks: Thoughts on implementing Spaceship ACC? I think I'm at least the third consecutive CM to say that I'll consider space ACC if a couple of people head over to the discourse forums and do a mock match so we can see how things work in practice. So far nobody's even done a first post. It's a bit more complicated than just adding a new hall—that part is actually super easy. But the system we use for Realism isn't really designed to get into nitty gritty dogfights the way it can handle lightsaber duels. I'm willing to put work into implementing it if there's going to be activity for it, but our non-traditional halls don't see a lot of use so I'm not optimistic there. For now there are no plans to add another format. Kojiro asks: The acc is fun. However some people don't like to be seen as weak or scared which can effect writers who utilise mind Force powers like Terror or Mind Trick. Especially if theirs a vast difference in resolve and the power. How, as a CM would you approach someone to give them advice on writing their opponents under the effect of such powers. Or how to handle when someone simple "fobs" it off so as not to be weak? Rule of thumb for me is that even Resolve 6 does not outright negate anything. Having high willpower does not automatically negate temptation. Temptations still exist, you are merely more prepared to deal with them. This is a good rule of thumb. The precedent is that physic powers always 'hit,' i.e. there's always some effect. Resolve, feats, etc just make it a lot quicker and easier to shrug off the effects. To me, it fits with Force powers. You're doing the same stuff at +1 and at +5. +5 is just way easier, quicker, more nuanced and refined. At +1 Force Lightning you have to stand there and get super pissed off and charged up like a DBZ character, and then you fire off a lightning blast and then you need a nap. At +5 there's no buildup and it doesn't take as much out of you. But the JM2 and the EL3 are still both shooting lightning at someone. Likewise, you’re going to recover from a Mind Trick sooner or later regardless of your Resolve. If your Resolve is a lot lower than the Mind Trick used on you, it’s going to take a while and it might require some external stimulus, and your opponent might not leave you alone long enough to recover. For what it’s worth, Wally provided an example of how he dealt with Terror in the first post of this match, and in this match you can see my approach to Mind Trick in the first post, and Tali’s take on it in the last one. Scudi: Would you consider doing member spotlight fictions that tie into the ACC's role of reporting on the readiness of the clans? Possibly. I want to spotlight members who are active in the ACC. Personally, my preference is to highlight their writing in matches as opposed to mine in reports, but if people like and respond to report fic I'm definitely willing to do it. Kul’tak: Any thoughts or potential plans for a seasonal ranking system for the ACC? Kind of like how the GRMG does it leaderboard style with possessions or titles to chase? Yes and no. Wally is working on a quarterly system for fiction, including the ACC, but it's still a work in progress and I don't know how much he's ready to share. All I can really say is that the proposal is moving along. For the ACC specifically, I'd have to get a better feel for how many matches we have in a quarter. Arden mentioned the Avatar of Strife title, which is automagically awarded based on Elo gain, so there's that. No plans currently to add anything else, but I might do it on a longer timescale than quarterly. Uji asks: What do you intend to do to entice members who typically avoid the ACC to jump back in and participate under your rule? There’s not one answer to this because there’s not one reason people avoid the ACC. To people whose only experience was the GJW XII prelims: That was in some ways a fantastic month for the ACC, with the most participation we’ve ever seen in the version of the combat center. I was in clan leadership at the time and some of my proudest moments in the club are of how members came together during it. However, it was also a very stressful time. Tempers were short, competitive spirit was high, some people were spreading negativity, and the judges (in this case Atra, Wally, Mav, and Farrin) were absolutely swamped with matches and unable to give quite as much detailed feedback as they would normally. For perspective, Atra judged as many matches during that event as I did during two years on staff. Needless to say, regular ACC matches are much less stressful for everyone involved. To people who have otherwise had a bad experience: You should feel free to come talk to me about it. I will not be overturning historical matches; however, I can make refinements to policy and documentation going forward. Atra found that the way we originally handled match feedback was too negative and wasn’t serving the community as well as it could have, so he changed the way judges approach it. I’ve already made some tweaks to how we review matches and the aforementioned tweaks to the CS Guide. Everyone on the ACC staff is committed to moving the institution forward and making it a better environment for competitive writing, and your feedback is a critical component of that. To people who are concerned about doing something wrong: To my mind, the ACC is like chess, fencing, or boxing. You lose pieces. You get hit. I’ve never seen a perfect ACC match. But the thing is, it’s not about being perfect. It’s about writing as well as you can, and then learning from the judge’s feedback and your opponent so that next time you write even better. To people who think their character isn’t strong enough: Take a look at the featured match this month. You character cannot be less useful in a fight than Jasper is. Now, that said, not everyone is going to like the ACC, just like not everyone likes poetry or collaborative writing or writing at all. That’s fine. Seriously. I don’t want people doing things they hate just for the sake of activity. But if you decide you’re not interested in writing for the ACC, I do hope that you’ll stop in from time to time to read a few matches, and I hope you’ll be there you help build your clanmates up when they take matches. Omgash that GIF! Fantastic first report, looking forward to the ACC again! Great report and great information, Arch. Killer. Enjoyed reading your report. I'm one of the new JM's and I'm definitely looking forward to doing all the different types of ACC matches, I've already had a great time reading through some of the historical matches. Hoping to get my ACC exam approved so I can give it a try!